Wrought iron furniture, that are usually used for patio and garden decorating, come into modern homes, creating a new trend in interior decorating with metal chairs and benches. The style and versatility of wrough iron chairs and benches give them endless decorative possibilities indoors. Vintage furniture design and metal home accessories bring retro style charm into modern interior decorating. Wrought iron furniture, especially chairs or benches, and metal home accessories are timeless and elegant decorative items that are always modern. If you want to add the flavor of 1950s style to your interior decorating, wrought iron chairs and benches are an excellent choice. Delicate bistro chairs and small benches with soft cushions dress up a hallway and a dining room. 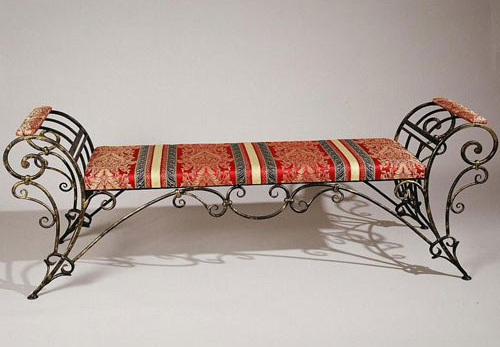 Elaborate and interesting metalwork involves detailed furniture design. Although wrought iron chairs and benches styles vary from contemporary to historical, modern furniture design often incorporates elements of both, offering versatile and elegant furniture that suit modern home furnishings. You can add traditional or contemporary wrought iron furniture and metal home accessories to your sun room and enjoy additional seats and stylish accents year around. Create a focal point with one exceptional chair or bench, or group wrought iron chairs around the table or near the window. Wrought iron chairs or benches are great for small interior decorating. Hallways and entryways, bathrooms and craft rooms will look gorgeous and stylish with a chair. (10 modern entryway decorating ideas) Wrought iron chairs can be used anywhere for extra seating also. Wrought iron chair or bench with soft decorative cushions can dramatically change your bedroom or master bathroom, creating modern interior design or home staging and making home interiors feel more luxurious and welcoming. 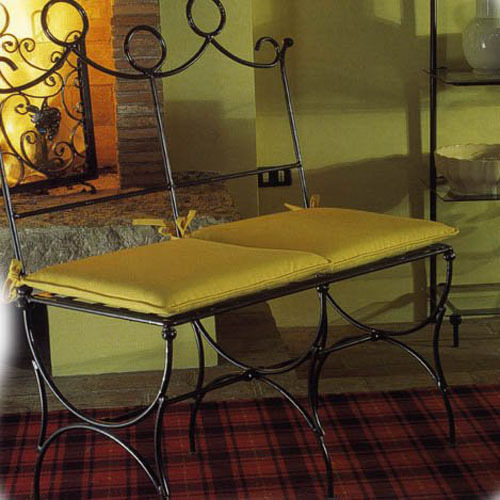 The delicate wrought iron furniture design of many chairs and benches fits nicely with soft interior decorating ideas. Wrought iron chairs and benches can give a garden vibe to dining room furniture and living room designs, offering retro-modern interior decorating ideas for creating stylish shabby chic room decor. A wrought iron bench in front of a fireplace or beside a wood stove is another great ideas for interior decorating with wrought iron furniture. A wrought iron chair or a metal bench with beautiful soft pillows, a small ottoman, a coffee table with a flower bouquet are charming and comfortable interior decorating ideas that create relaxing atmosphere and provide a beautiful retreat for rest.